With a piezo disc and some basic electronic components, any surface can be transformed into a giant musical controller and played through your iOS device using open-source software. In this tutorial, we will learn how to sonify skateboard elements such as grind rails, half-pipes, launch ramps, and fun boxes and turn any skate surface into a musical playground. 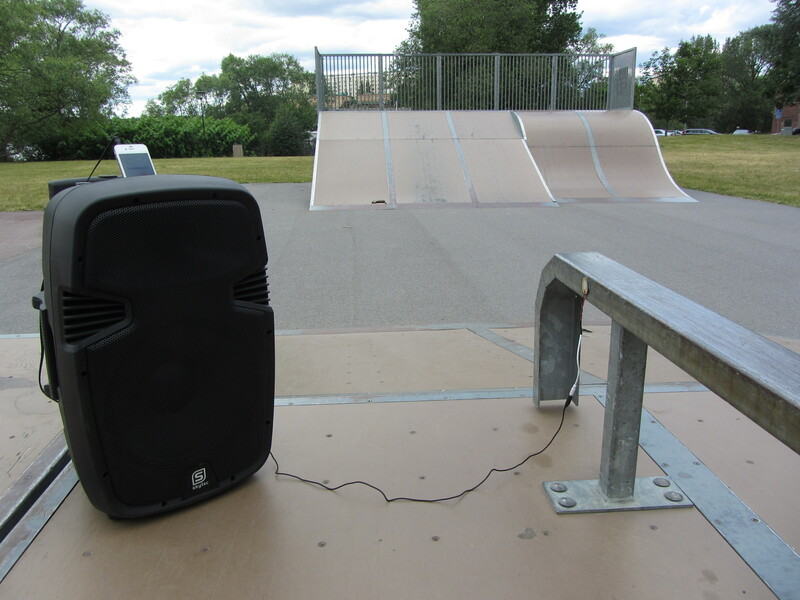 Customize your skateboarding experience with your own sounds and create your own musical composition/performance/sound art. The piezo disc connects in the mobile device’s input jack and triggers sounds when hit using MobMuPlat’s open source software platform. Audio signals from the piezo are converted into .wav file triggers. MobMuPlat is an open-source software platform which runs Pure Data on iOS devices. With MobMuPlat you can program which sounds to trigger inside the app with .wav and .aif file extensions. Cut and strip a 3.5mm stereo mini jack cable. 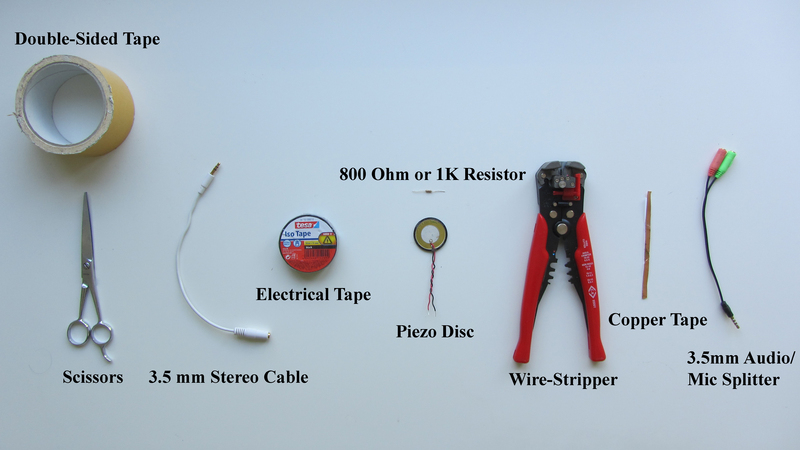 Test Ground, Audio L and Audio R wires with a multimeter. Separate ground wires with Audio L and Audio R wires. Twist both Audio L and Audio R wires together. Connect Audio L and Audio R to the black wire of the piezo disc and ground to the red wire of the piezo disc. Insert a 1K or 800 Ohm resistor between the ground wire and the Audio L and Audio R wire. Most devices will not recognize the piezo as an external mic, so we trick the device into thinking it is an external microphone by running a 800 Ohm or a 1K resistor between the mic and the ground wire. Wrap in copper tape or solder the wires together. Add additional electrical tape to insulate the cables. MobMuPlat is a standalone iOS app which hosts and loads an audio engine using the graphical programming language, Pure Data (PD). Insert Piezo into the "Mic" Input of the Audio and Mic Splitter. Run the MobMuPlat app on your IOS device. Test Piezo is recognized as an "external microphone." Open MobMuPlat on your iOS device Tap the Info Button Select Audio/MIDI button on bottom of screen. This will open the Audio/MIDI settings page. Scroll down to Input: It should read: "Headset Microphone channels: 1"
If your device is recognizes the Mic Input as "Headset Microphone" you have successfully connected the piezo. If not, double check your connections and make sure you wired your Audio L Audio R and ground connections properly. In the Audio MIDI settings screen, tap on "Select Document" Scroll to the downloaded Skatehack sample patch from Step 2. Open the file "skatehack.mmp"
You piezo disc should now trigger the sample 1.wav file. Adjust the audio input sensitivity and the output volume using the sliders Tap "Randomize" to scroll through 6 different audio files. To create your own custom sounds. Connect your iOS device to Itunes. create an audio file and label it 1.wav, 2.wav. Under the Itunes folder, drag the newly created files into the "Documents" section. This will replace the sample files with the new files. Connect a portable speaker to the "Audio" output of the Audio Mic Splitter cable. Attach piezo to trigger surface. 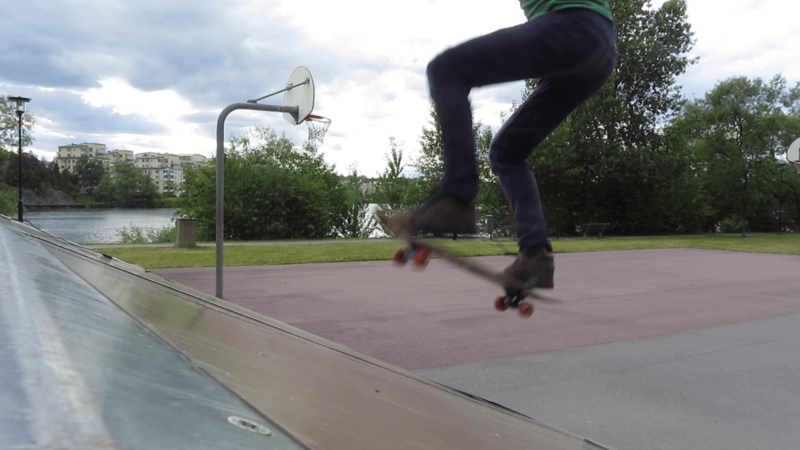 Skatehack is an urban research project with a focus on sports, open source technologies and DIY hacking. Skatehack hosts various projects, events and workshops for young adults all over the world to develop, create and share new experiences in the urban environment using open source software, hardware and digital tools. Skatehack started in 2010 as an investigation, reflection and critique on current trends of ownership in physical and virtual environments and since then has developed projects for kids who aren’t attracted to traditional team sports to go and express themselves in a creative, scientific and athletic manner. 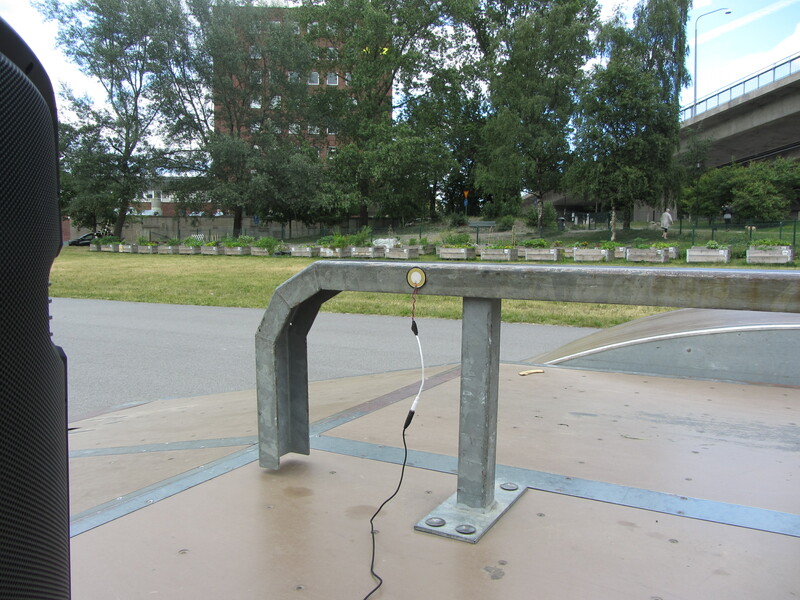 Skatehack has constructed interactive skateboard ramps in the US, Sweden and Norway demonstrating how open source tools and technology can be used to reshape our environment.